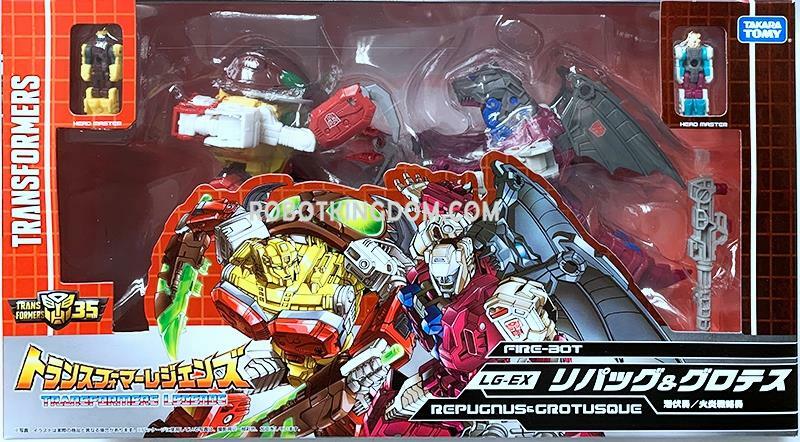 Courtesy of friend site and sponsor Robotkingdom, we have our first images of the packaging of the new Takara Tomy Mall Exclusive LG-EX Repug & Grotes (Repugnus & Grotusque) for your viewing pleasure. 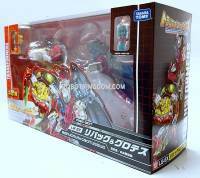 This is the Japanese release of these new incarnations of the G1 Monsterbots. 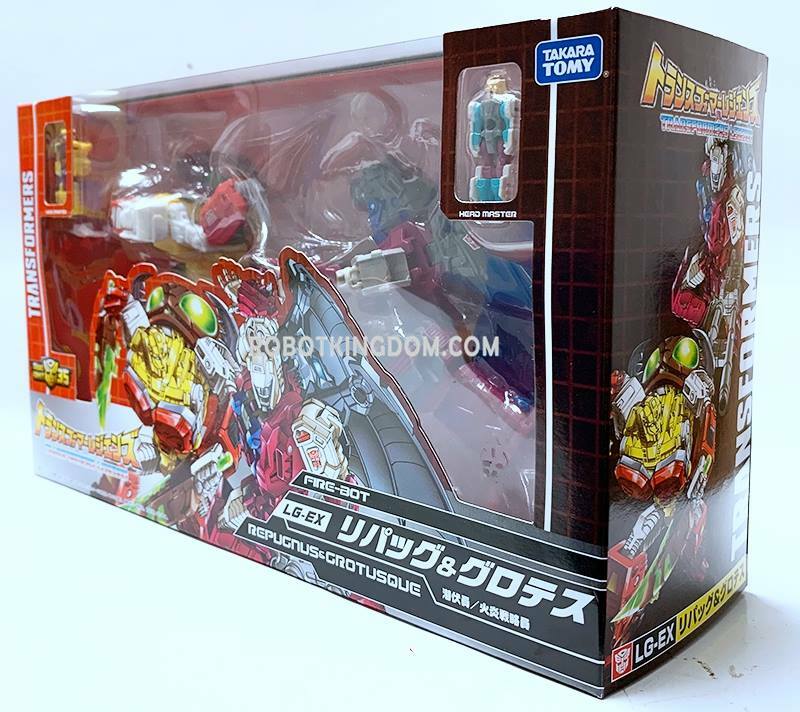 While LG-EX boxes are usually closed boxes, this release is using a nice windowed box, so we can see both Monsterbots as if they were about to fight. Repugnus (or Repug in Japan) comes in cartoon-accurate colors from the Japanese Transformers: Masterforce series and includes his Headmaster Hedgehog (repaint of Hasbro’s Titans Return Dastard). Grotusque (or Grotes in Japan) includes his Headmaster Platinum Tiger (repaint of Hasbro’s Titans Return Fengul). This 2-pack is expected to start shipping on January 26th, 2019. You still can pre-order it via our sponsors below. Click on the bar to check out the mirrored images and then sound off on the 2005 Boards! I'm sorry to hear that happened to your Dai Atlas figure, but thanks for sharing, as I also plan on getting the Big Powered set myself. It's always odd and aggravating whenever the companies choose to pain a part that through normal use, would constantly scrape against other parts. Grotusque is a prime example of this, of course, as his headmaster's head and backpack (Grotusque's robot face) are practically slathered in paint. It's always an annoyance when the companies do that to a "premium item". I'm also annoyed that I can't seem to find a color match for whatever color paint the companies used for the headmaster's head, nor have I been able to mix my own, so if there's paint scraping, it'll be a complete pain in the rear end to repaint it and get it to match the original paint. Its like gray brown dirty white combo that is hard to get on one mixing. Not to mention its glossy enamel thick baked like consistency. Good luck at that. Fortunately, on Grotosque, no chipping yet. How about leaving the titanmaster heads with their respective bodies and just changing the backpack? Give the monsterbot faces to some junk masters and you can have your little painted beastformers with random backpacks that don't really matter, and your monsterbots with their faces, at the same time. Yeah, this seems like the better solution. Otherwise you are constantly unscrewing/rescrewing the backpack just to swap out the little head, which can lead to stripped screws or stress marks on the backpack. It took a while for me to go through my junker parts bin. These are good ideas, but the issue I have is that nearly all the junker Prime Masters/Titan Masters I have are Wave 1 Prime Masters (the ones with a pin attaching their backpacks to their bodies, rather than a screw as in most Prime or Titan Masters), namely Micronus. So, there's no real easy way to separate the backpack from the rest of the figure and any attempt to try to remove the pin (likely through some sort of heat gun) will probably damage the figure anyway. The idea that was proposed (to swap the backpacks so the junkers have the Monsterbot faces and the Beastformers have the junker backpacks) is a good one, but it does leave the Monsterbots with heads whose sides and backs aren't accurately colored to their G1 imagery (of course, because the junker figures would not be the correct color anyway). So, because I just don't have enough of the little figures with screws as opposed to pins to implement the proposed idea (and finding the aesthetic off due to the colors even if I swapped the backpacks), I've done some more thinking and came up with the following idea instead. I've decided to pop off the heads of the pinned junker Prime Masters (and trust me, trying to replace the heads once they have been popped off is a pain in the rear end as the connection is tight and you can't loosen it as there is no screw to unscrew) and keep them around my Monsterbots. Each time I want to use the Monsterbot headmasters as robot heads, I'll just pop off the heads on the Beastformers and replace them with the heads from the junker Prime Masters. The junker heads would then be what gets plugged into the Monsterbot's neck sockets for robot mode. When the Monsterbots are in monster mode and thus have their heads separated, I'll just replace the Beastformers' heads back onto their bodies. This really isn't too different from popping a ball joint out of its socket, as that's literally what connects a Titan or Prime Master's head to its body. The Beastformer headmasters can be loosened slightly to make it easier to swap their proper heads with the junker heads when I want them to be heads for the Monsterbots. I find that this approach isn't too bad a solution and it avoids the concerns of screw stripping and potential cracking of the backpack. As mentioned, the whole reason I'm even doing this is to avoid paint scraping on the faces of the Beastformers as they all have painted faces. I've also found that Repugnus' head is very loose and falls out easily if you plug his headmaster (Hedgehog) with its proper head into his neck socket, so replacing it with a Micronus head made for a tighter connection. The only concern I see here is probably paint scraping on the back of Grotusque's face plate (the small vertical bar you can see on the back of a Prime or Titan Master's backpack within the socket if you take out its head) and on the ball at the base of Platinum Tiger's head, both of which would happen when Platinum Tiger's head is popped off when replacing it with the junker head. However, those parts in question are not visible when Platinum Tiger's head is plugged into his body (Grotusque's headmaster). I guess this is a necessary evil and kinda inevitable if you fiddle around with the figure quite a bit, since Grotusque's headmaster features a lot of painted areas and paint chipping/scraping would likely happen eventually. At the very least, said paint scraping isn't on Platinum Tiger's actual head and face, which is the part that the designer's want you to plug into Grotusque's neck socket for his robot mode. Who came up with this is still beyond me, as that's a paint scraping issue waiting to happen. Related to my last few posts on this thread, and given that I found some junker Titan and Prime Masters in my parts bin, I just realized a relatively simple solution to the paint scraping issue for the Grotusque headmaster (and the other two Monsterbot headmasters as well, since they all have painted faces that will plug into the neck sockets to form the Monsterbot heads). Simply take the heads off from any junker Titan or Prime Master, and then replace the Monsterbot headmaster heads with those junker heads when you want to form the Monsterbot heads in robot mode. That basically eliminates even the possibility of paint scrapping through the neck socket, since you are plugging the junker heads into the sockets and not the actual Monsterbot headmaster heads. The only real pain in the rear end with this solution is having to take apart the headmasters by unscrewing them each time you want to swap heads. That's logical. There is a small gap between the very front of the neck socket and the headmaster's head when it is plugged into said socket, so plugging in the headmaster with the face facing the main body's torso ensures that there is that gap so the face doesn't scrape against the walls of the socket. There doesn't seem to be any such gap on the back of the socket, so it seems like plugging in the headmaster with the face facing the wings will likely cause paint scraping as the headmaster's face would likely make contact with the back wall of the socket. And Fengul has quite the sculpted face, so plenty of chances for that to happen. Do you plug the headmaster into Grotusque's body with the headmaster's face facing Grotusque's torso or his wings? Huh, alright then. In the event that paint chipping occurs, does anyone know what sort of paint color Fengul's head is? I can't seem to find a good color match from among Citadel or Mr. Hobby paints. Maybe, but I do want to transform him to robot mode too, and that'll entail attaching the headmaster to the body as well. That being said though, the Legends comics revealed that Grotusque himself hated his own body and actually didn't mind being decapitated and separated from it as a result. He consoled Platinum Tiger and said that much when they were both stuck in another dimension and the latter blamed himself for their predicament. It's ironically in character for Grotusque then if you don't use his headmaster functionality. I plug my Grostusque headmaster into the neck socket with Fengul/Platinum Tiger's face facing forward (meaning to say, facing the main body's torso), presumably the opposite of what you do. I suppose I'm concerned that if I do it the way you described, Fengul/Platinum Tiger's face could scrape against the back wall of the neck socket and thus scrape paint off from the face. It seems "safer", in my opinion, to plug in the headmaster with the robot mode face (the part that plugs into the neck socket) facing the main body's torso rather than its back. As for Twinferno, I have the Takara version and that one's headmaster is already painted. I plug it into the main body the same way I described for Grotusque's headmaster as well, and I haven't had any paint scraping issues thus far, but then again, the head isn't completely painted as is the case with Grotusque's headmaster's head. I think it depends on what sort of paint you used to paint Daburu. If it's say Citadel paint, yeah, that stuff rubs off quite easily if the part it is painted on comes into repeated friction with other parts or you touch the painted part very often. I find that Mr. Color paints tend to stick on much better. Won't scratch the paint if you leave him in monster mode. Hasbro's has the painted TM head too. I plug it in facing the main body's back/wings. So far mine hasn't scratched at all. So would you do it with the headmaster's robot face facing forward or back? So, you prefer a headless robot then? Don't plug the head in? 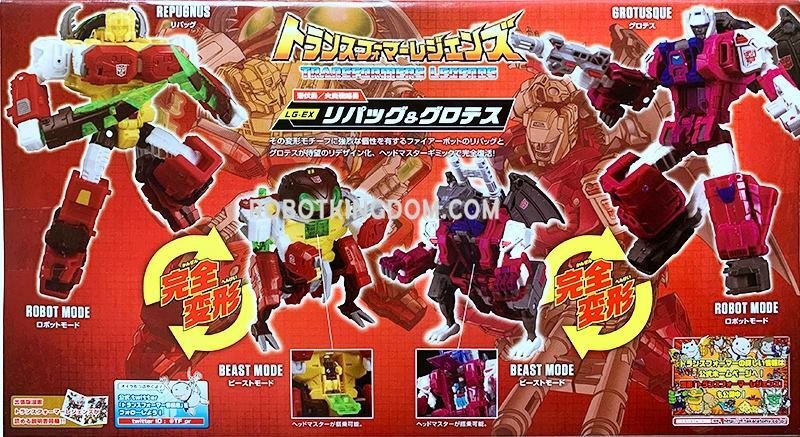 It seems that Grotusque's headmaster has a painted robot mode head, so it looks like paint chipping or scraping could be a concern when inserting the head into Grostusque's neck socket. Are there ways to help avoid this?